I reviewed a disc of Dutilleux’s chamber music with piano containing three of the duo works, but omitting the Choral, cadence et fugato for trombone and piano and adding the Piano Sonata [review]. Here we have a cross section of his chamber music both with and without piano that gives a better idea of the composer’s range by covering his whole career. As I noted in my earlier review, the first three duo works are basically exam pieces Dutilleux composed for the Paris Conservatoire. They are more reminiscent of Dutilleux’s predecessors, including Ravel, Fauré, Poulenc, and Frank Martin, than of the mature composer who later found his very own distinctive voice. Indeed, I would describe the Sarabande et cortège for bassoon and piano as ‘Ravel meets Martin’ in its rhythmic, even jazzy, passages. Both this and the earlier account by Francesco Bossone and Akanè Makita are excellent and it’s hard to choose between them. I have a slight preference for Fany Maselli’s tone, though Bossone/Makita make a powerful impression in their somewhat more deliberate manner. The new account perhaps flows better and is recorded less closely. Choral, cadence et fugato for trombone and piano, is in some ways the most interesting to me, as it points the way in which Dutilleux would develop as a distinctive composer. It still shows only hints of the established composer in its use of jazz harmonies. This is the first time I have heard the work, but the account by trombonist Jonathan Reith and pianist Vichard is fine and fully the equal of the performances of the other works on this disc. With the Trois Strophes sur le nom de SACHER for solo cello, we are exposed to the mature Dutilleux, one of the most remarkable composers of the late 20th century. The genesis of the three “stanzas” was a commission by cellist Mstislav Rostropovich to write a piece for Paul Sacher’s 70th birthday. Dutilleux responded with the first of the ‘stanzas’ and later added two further movements. Rostropovich had already given the first performance of Dutilleux’s great cello concerto, Tout un monde lointain….and so the composer was undoubtedly familiar with the cellist’s fabulous technique and sumptuous tone. Dutilleux was not the only composer commissioned to celebrate Sacher’s special occasion, but one of twelve. Dutilleux produced a technically demanding composition with the two lower strings of the cello tuned lower, the G string to F sharp and the C string to B flat and he gradually introduced the name SACHER into the music by means of the musical notation. He employed a variety of technical effects and quoted Bartók’s Music for Strings, Percussion and Celesta in the first of the stanzas. Sacher of course had commissioned Bartók for his famous work. Thus, Dutilleux created a kind of double homage here. The three stanzas as a single composition work beautifully, with the second one a slow movement followed by a finale marked vivace. All three stanzas contain a reference to Sacher’s name. I don’t have Rostropovich’s definitive account to hand, but Alexis Descharmes is an eloquent advocate of the work. His technique is formidable and he has a rich and beautiful tone. I found his performance preferable to the very good one by Tatjana Vassilieva on Naxos. He phrases exquisitely and does not shortchange either the ebullience or darkness of the music. He seems to revel in such effects as glissando and quasi col legno inhabiting the piece. His attention to the full range of dynamics is unimpeachable. In every way, this is a deeply satisfying performance. I first made my acquaintance with Les Citations, arguably the most important selection on this programme, when I reviewed the third installment in Ludovic Morlot’s series of Dutilleux orchestral works with the Seattle Symphony last year [review]. I was very impressed with their account as I am with this new one. The most audible difference between the two recordings is the addition here of a short phrase on the double bass that appears twice in the piece. 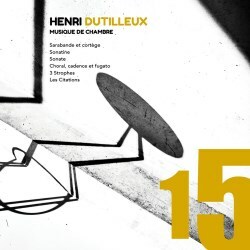 Dutilleux revised Les Citations several times after the original version, which consisted of a single movement for oboe, harpsichord, and percussion. When he composed the second movement in 1990, he added a double bass to the instrumentation. Then in 2010 he revised this version to pay homage to his wife, pianist Geneviève Joy, who had recently died, by integrating two passages for double bass taken from a bassoon solo in his early ballet Le Loup—a theme that Joy particularly admired. These are very clear on this recording, the first appearance near the end of the first movement and the second occurrence after the harpsichord solo that opens the second part. To some ears they may seem incongruous with the rest of the material, but they add a dash of colour that I find affectionate and amusing. Morlot leaves these out in the Seattle performance. Otherwise, there is little to choose between them. Morlot’s approach to the work is perhaps more refined and a bit softer, but the recording itself no doubt contributes to this impression. This one with oboist Cismondi is recorded more closely and with greater impact—the percussion especially so. I have gained a better appreciation for this most original and intricate composition with this new account. I was unfamiliar with this label before, but they have provided an attractive presentation with a cardboard foldout case and slot for the CD booklet. The booklet contains numerous colour photos of the musicians and brief, but informative notes on the works in both French and English. Unfortunately, the notes on the individual musicians are in French only. For someone curious about Dutilleux’s chamber works this programme seems like the ideal place to start, supplemented by his equally remarkable String Quartet, Ainsi la nuit.